The original EMC EA was built for the Baltimore & Ohio in the mid-1930s. The "E" series was introduced by the Electro-Motive Corporation and carried on, quite successfully, under General Motors as a singular diesel locomotive which was not semi-permanently coupled to a trainset (such as the Zephyrs or UP's M-10000). The B&O ultimately came to own about a dozen of the new, streamlined diesels, which had yet to be a proven replacement for steam. Other railroads went on to purchase these very early Electro-Motive passenger designs included the Union Pacific and Santa Fe. The units were a vastly different from the standard of the day, utilitarian steam locomotives and heavyweight cars that provided neither streamlining nor color. Ultimately, diesels proved quite successful, particularly after the FT demonstrator set hit the rails in 1939. The EAs remained in use on the B&O for many years before being retired and today, one remains preserved, #51 at the Baltimore & Ohio Railroad Museum in Baltimore. At the time the EA was constructed Electro-Motive was still a mostly independent company, although it had been purchased by GM in 1930 (it became an official division of the automaker in early 1941). The EA (E, which stood for Eighteen hundred horsepower) carried two 900-horsepower, 12-cylinder 201-A Winton engines and the first buyers of these models were the B&O and Santa Fe (while mechanically the same the AT&SF's units were classified as E1s). It did not take long after the EA's debut for the industry to realize the success of the locomotives. With the onset of World War II diesel locomotive construction was restricted during wartime but the EA, E1, and E2 had been in service long enough for railroads to witness their capabilities. Essentially, the EA utilized the mechanics of the builder's passenger boxcab diesel it had built a few years earlier in 1935. The basic difference was that the EA came packaged in a stunning, streamlined carbody with a shoveled nose, a trademark of later models. While the EA itself came equipped with 1,800 horsepower, EMC also manufactured a cabless "B" unit known as an EB, which doubled its total output to 3,600 horsepower. Overall the EA featured an A1A-A1A wheel arrangement (whereby the center axle of the three was unpowered) using four General Motors' model D7 traction motors; coupled with a weight of 150 tons and overall length of 69-feet the EA could produce a continuous tractive effort of 31,000 pounds and top speed of nearly 120 mph. 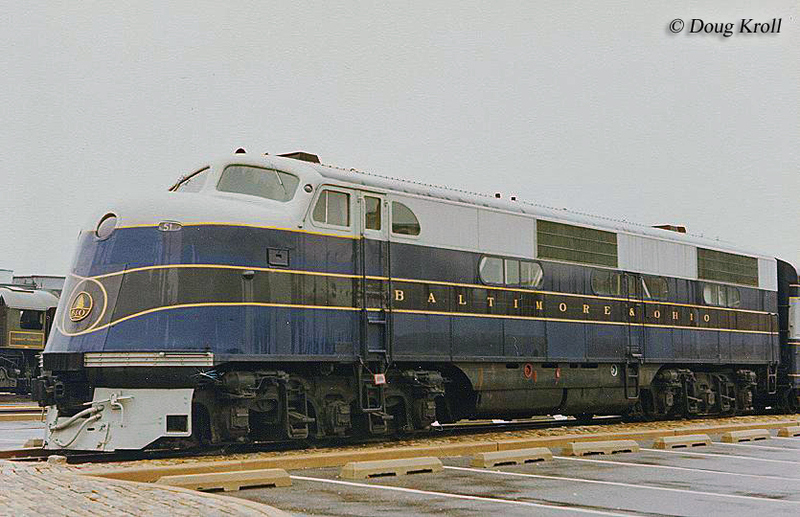 In the end the B&O came to own six EAs and six EBs, which were originally used to power its most prestigious passenger trains such as the Capitol Limited, National Limited, and Royal Blue. 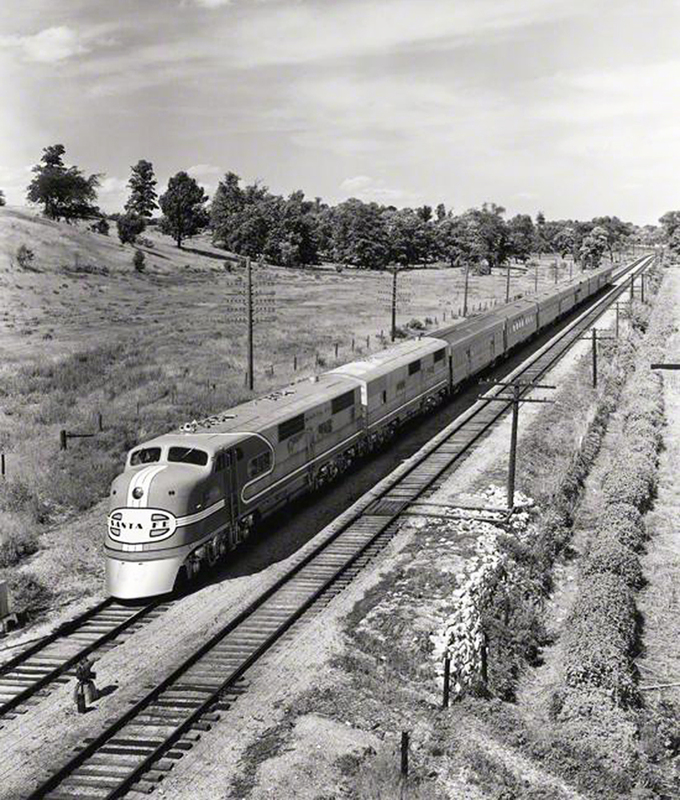 During the same period (1937 and 1938) Electro-Motive also developed similar models for the Santa Fe and Union Pacific. 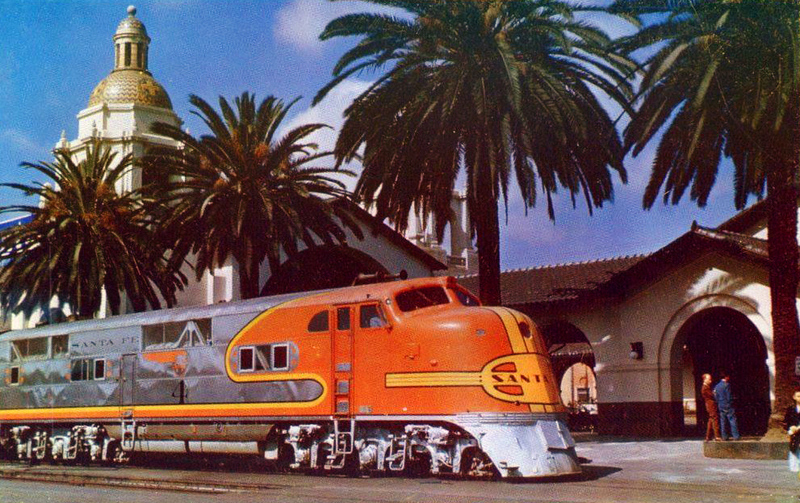 The Santa Fe's locomotives, used on its new streamlined trains between Chicago and Los Angeles (the Super Chief, for instance) were dubbed E1s and inwardly and outwardly were essentially identical to the B&O's EA model. The AT&SF came to own 8 E1As and 3 E1Bs. 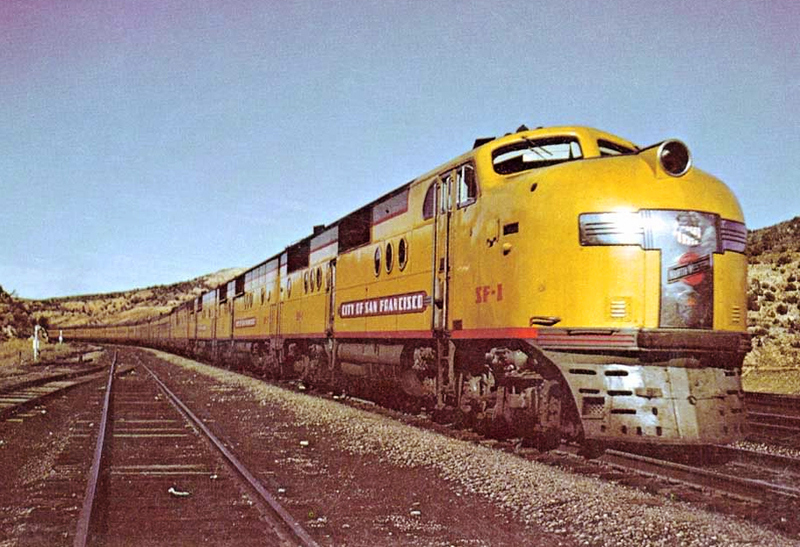 The Union Pacific's model was known as the E2 and varied slightly from the EA and E1 in that its carbody styling featured a more pronounced and beveled front nose with no tapering or "slanted" appearance. The UP's E2 also differed in that they were somewhat built as matching A-B-B sets (although they were not semi-permanently coupled), in which the railroad came to own two such designs. Combined the A-B-B set could produce 5,400 horsepower, with each unit again able to produce 1,800 horsepower using two Winton 201-A prime movers (900 horsepower each). 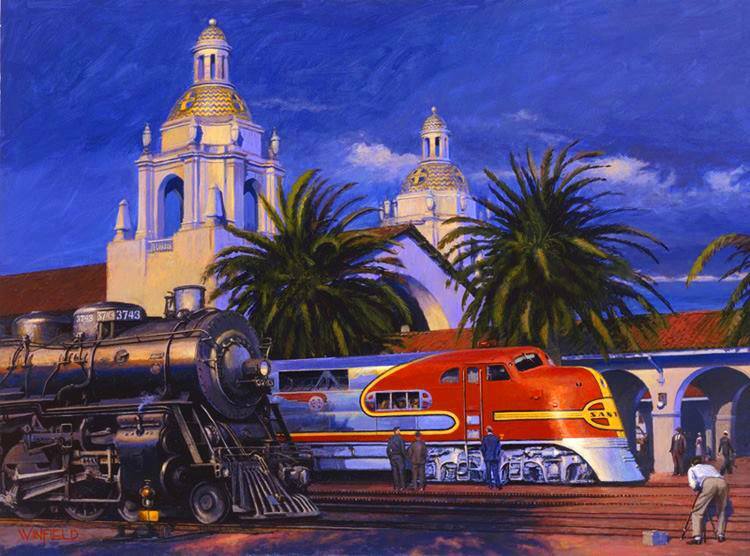 The UP's two sets were dubbed SF (1, 2, and 3) and LA (1, 2, and 3) for the passenger trains they powered (the City of San Francisco and City of Los Angeles). The EMC EA, E1, and E2 were the only such models in the series to use the Winton Engine Company's model 201-A as future designs, starting with the E3, employed General Motors' much more reliable and rugged model 567 prime mover. Perhaps most importantly these early passenger models saw a significant change in how future locomotives were built with less of an emphasis on custom building (as was the case with steam) and more of a focus on a mass-produced, assembly-line scale which greatly reducing their cost.